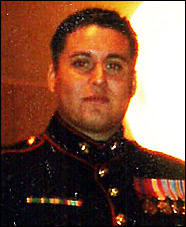 Guadalupe “Lupe” Ontiveros III wanted to see the world, serve the country, and better himself when he enlisted in the United States Marines Corps out of El Paso, Texas in January of 2002. He served the country through January of 2007. After a month aboard the USS Belleau Wood, USMC Cpl. Lupe Ontiveros and the 11th Marine Expeditionary Unit set boots on sand July 6, 2004 in support of the Global War on Terrorism. Shortly after reaching Al Asad Air Base in Iraq, the unit was attacked by enemy mortar fire. This was the first of countless attacks on foreign soil, that Corporal Ontiveros experienced. While it was not the most serious attack he encountered, it was the one that had the biggest impact on his state of mind. He found himself face down in the sand in an overwhelming state of confusion. The unit received a barrage of mortar fire that hit closer than 50 yards from its position. Corporal Ontiveros was nearly knocked unconscious. This was merely the beginning of his six-month tour. Most of the serious scars he’s afflicted with are invisible ones, namely post-traumatic stress disorder (PTSD). The years of war in Afghanistan and Iraq have brought PTSD among military personnel to the attention of the American people as never before. Blast waves from explosions rattle the brain and can cause traumatic brain injuries which are often linked to PTSD. Most PTSD sufferers repeatedly relive the trauma in their thoughts during the day and in nightmares when they sleep. While the condition varies from person to person, more and more studies have linked PTSD with chronic depression and suicidal ideation. Corporal Ontiveros, who has an overall disability evaluation of 80%, suffers from obstructive sleep apnea and PTSD. Among the commendations received by Corporal Ontiveros are the Marine Corps Good Conduct Medal, Sea Service Deployment Ribbon, Global War on Terrorism Expeditionary Medal, Global War on Terrorism Service Medal, National Defense Service Medal, Navy Meritorious Unit Commendation, Navy Unit Commendation, Certificate of Commendation (Individual award), Expert Rifle Badge (3x), Meritorious Mast, and the Good Conduct Medal. Corporal Ontiveros, his wife Samantha, and daughters Trinity and Bethany were gifted a home in Missouri City, Texas in December of 2014.